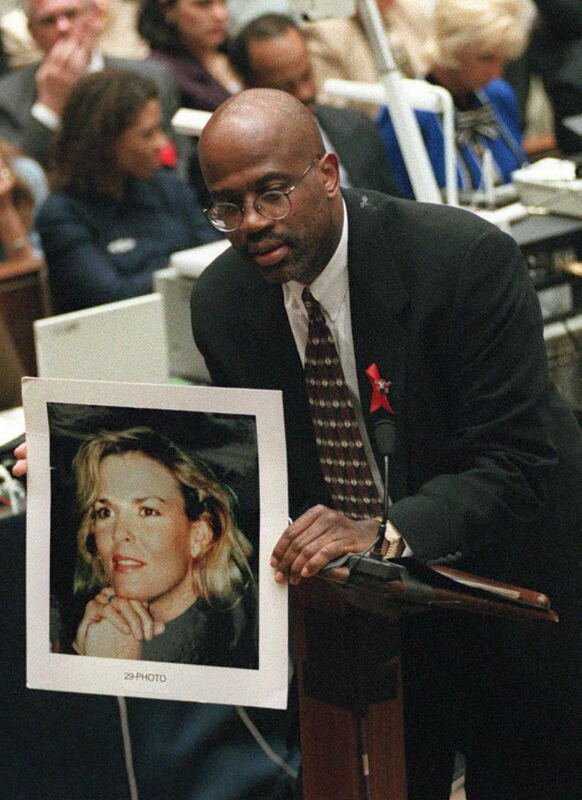 "It appears to us what Nicole Brown was doing was leaving a trail for us of what happened in 1989," Deputy District Attorney Christopher Darden said in court about the box, according to the Chicago Tribune. In December 1994, the prosecution broke into the safe deposit box, which was held at a bank, and admitted its contents into evidence, as reported by the New York Times. The prosecution wanted to use evidence of alleged domestic abuse as evidence against Simpson, but the defense argued that domestic violence doesn't always lead the murder and that Brown Simpson was keeping the box's contents to use for their divorce settlement. According to the New York Times, the prosecution withdrew 16 out of 80 reports of alleged abuse from the court and Darden said about this decision, "we have not retreated from the use of the evidence in this case ... And we will use it when the time is appropriate." In the end, the jury did see the contents of the safe deposit box, along with other evidence of alleged domestic violence, according to the same Chicago Tribune article. In his 1997 civil trial, when Simpson was found liable for the deaths of Brown Simpson and Goldman and ordered to pay their families $33.5 million in damages though he maintains his innocence, he addressed some of the box's contents. Though Simpson claimed that he never beat his wife and wasn't sure how she became bruised as seen in photos from the 1989 incident, the New York Times reported, he did say that he "felt fully responsible for what happened" and claimed they had "wrestled." Simpson also claimed that his ex-wife's diary entries were lies. "Nicole I love you more than ever as I watched you at the party ... It must be because of those feelings that I reacted so emotionally...Let me start by expressing ... how wrong I was for hurting you ... There is no exceptible [sic] excuse for what I did...I know you've gone thru a lot over the years but, thanks to you I believe we're on the verge of having one perfect marriage. I know that may sound crazy after the other nite [sic]..."
In Brown Simpson's journal, she also wrote about alleged incidents of abuse and stalking from Simpson. "He threw a fit, chased me, grabbed me, threw me into walls. Threw all my clothes out of the window into the street three floors down. Bruised me," she claimed in an entry, according to The Philadelphia Inquirer. Simpson responded to these accusations in a 1996 interview with journalist Ross Becker and he refuted the claims of stalking, as well as any abuse. "In 1989, I was wrong," Simpson said in the video. "I physically removed her from my bedroom and I was wrong ... This was a family argument and when it was over, I left, and she called me the next day and apologized for calling the police ... Nothing physical happened between us." The contents of Brown Simpson's safe deposit box were first brought to the public's attention during Simpson's trial, but due to O.J. : Made in America, they're back in the spotlight over 20 years later.